This page is about the American naval fighter F4U-1C. 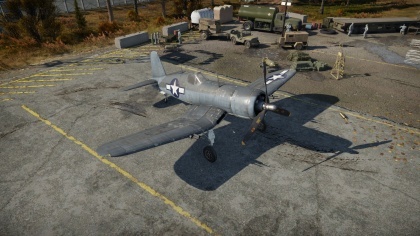 For other uses, see F4U (Family). The F4U-1C Corsair is a rank III American naval fighter with a battle rating of 5.0 (AB) and 4.7 (RB/SB). It has been in the game since the start of the Open Beta Test prior to Update 1.27. Loved by its pilots, hated by its enemies, the F4U-1c is an easy to use U.S Navy fighter, with robust all-round specifications. The Corsair optimally performs with stealth ammunition loaded for best damage output, allowing an experienced pilot to take out several targets before returning to base and reloading. It is best to selectively aim for the most critical parts of an enemy plane if you want to maximise kill efficiency while you're in the sky. A few 20mm shells to an enemy engine or cockpit will destroy their plane with a little luck. While this may seem easier said than done, diving onto your opponent is almost a guaranteed kill, and if you are unlucky, you still have an incredibly impressive dive speed under your belt to keep you from being a target. While flying this plane, like any U.S fighter, you'll be in the most danger when you are 'floored' (at a low altitude), since your only escape is diving. Facing mainly Japanese planes in Realistic Battles and Simulator Battles, it is important to note not to turn with A6M5sand the like, but to use Boom and Zoom tactics. 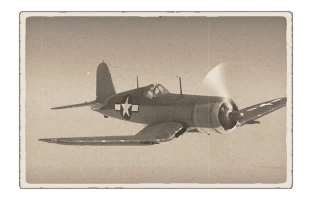 The F4U-1c is an excellent plane in all game modes, however, be aware of the very restrictive cockpit, which makes it extremely difficult to spot targets in Simulator Battles, especially those behind you. A major advantage of all US cannons are the default belts. They have the highest ratio of high-explosions shells of any tracer belts, only the stealth one is in that regard better. This makes the ammunition upgrade unnecessary and allows for a focused research on the performance upgrades. As acceleration is the one of the planes flaws, going for "Compressor" and "Engine" first is advised. The recoil from the cannons will yank the nose down quite a bit. Cannons are highly inaccurate to the point of uselessness unless upgraded. This page was last edited on 7 April 2019, at 14:20.